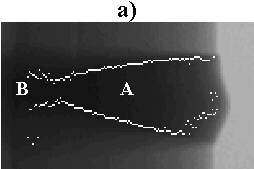 The present research deals with nondestructive control by radioscopy of a weld bead which assembles two cylindrical components fitting into each other. Mechanical resistance of the component is ensured by determination of the general shape of the weld bead (penetration depth, etc...). The required precision entails processing an important number n of images. Thus an automatic control process of the weld quality must be defined. A previous study showed it was possible, thanks to an edge type approach, to extract the weld bead section from each radioscopic image . Nevertheless, the obtained results showed that this sole approach did not allow determining in a reliable way the bottom of the bead limits. An improvement of the technique is then presented in this paper. It associates an area type approach with the edge type one. The area approach uses a thresholding method based on histogram analysis. The "edge and area" combined approach was then adapted to take into account the noise present in the acquisition system. 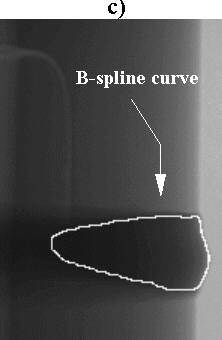 The segmentation leading to the extraction of the weld molten zone limits is finally performed on an initial radioscopic image using a B-spline curve. The automatic control of the n-1 following images representative of the weld is then achieved. It finally leads to a quantification of the parameters used in the experiment, and namely the penetration depth. The method is relatively fast and totally compatible with the constraints related to industrial applications. The examined welds are heterogeneous, as the welding, using an electron beam facility, is obtained with a filler metal which shows an attenuation greater than that of the two components that are assembled. The radioscopic system supplies images whose grey levels are reversed in comparison with those usually obtained from standard radiographic images. The molten zone thus appears as having darker grey levels. The inner volume of the component is filled with very absorbent material. An irradiation perpendicular to the weld plane cannot be envisaged because of the height of the component to be controlled. 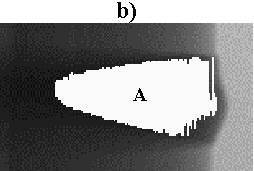 So tangential irradiation was selected (figure 1). Fig 1: Principle of tangential radioscopic acquisition. The complete control of the weld is thus performed by a succession of tangential irradiations obtained at the different angular positions F i of the component. For the control to be sensitive to any weld evolution, it was decided to inspect the weld bead every 2 degrees. This means that a set of 180 radioscopic images are processed. The image obtained by projection, for a given angular position F i, contains the weld section, among other possible ones. Indeed, tangential irradiation entails stacking several weld sections by projection. The resulting image is thus strongly heterogeneous as it is made of two zones. The first is made of molten zone and the second of parent metal and molten zone mixture whose proportion respectively depends on penetrated thicknesses. The result is thus a weak contrast. Moreover, owing to the component circular geometry, the beam radiates through variable thicknesses. The image background is therefore not constant, which makes the extraction of the molten zone limits difficult. where I0 is the intensity of the incident radiation, tpm and tmz the penetrated thicknesses of parent metal and molten zone, mpm and mmz the attenuation coefficients. Considering a monochromatic beam, these coefficients are determined when an equivalent energy of 45 keV is selected. The distance between the component and the detector is big enough to neglect diffusion. The geometry of the weld bead is not precisely known. Thus it was modelled by a polynomial curve. The thicknesses tpm and tmz penetrated along the X-ray beam are then calculated. Solving relations (1) and (2) leads to the formation of the numerical image, as shown in figure 2. This image perfectly illustrates the control difficulties. The contrast was found to be very weak, particularly in the bottom of the weld bead, and even in the absence of noise. Knowledge of the weld contour on the simulated image allowed further advances in the detection strategy. Indeed, in figure 2, the grey levels column shows that the transition between the molten zone and what lies outside its perimeter (mixture of molten zone and parent metal) is defined by the ends of a plateau. The latter marks the limits of a grey levels homogeneous zone that is characterized by a null gradient. The procedure then consists of searching, according to each column of the image, the points of null gradient which characterize both ends of the plateau. Calculating the gradient is done on three neighboring points, using the filter [-1 0 1]t. The convolution result is given in absolute value. The detection result, illustrated by the white points, is shown in figure 2. Two zones, A and B, are clearly displayed. A represents the limits of the molten zone. B apparently does not characterize the weld contour. The existence of this heterogeneous zone is due to the presence by 2D projection (see figure 1) of molten zone in this part of the image. Its shape depends on the weld geometry. Indeed we showed that the presence of a finite radius of curvature in the bottom of the bead will always display a zone B in the image . This zone must be eliminated to precisely determine the bottom of the bead as it directly influences the penetration depth measure. Fig 2: Search for the molten zone limits within the grey level column of the simulated image. Definition of the edge approach principle. In a previous study, a criterion based on a minimum radius of curvature determined by micrographic tests was used to position the bottom of the bead . This technique was assessed to be too dependent on the weld geometry. So a more reliable general approach is developed in this paper. When one studies the grey level histogram of the points located between the ends of the plateau for each column of the simulated image, one shows it is monomodal. The histograms monomodality is a common problem when radiographic images are processed. They show great grey levels variations mostly due to a difference in penetrated thicknesses. This results in the presence of a gradient in the image background. Suppressing the gradient may be obtained by a trend removal process. For this purpose, a particular image is subtracted from the original one. a reference image which corresponds to the ideal model of component radiography . The characteristics of the studied images led us to choose the last solution. The reference image subtraction obtained by simulation and characteristic of the background gradient allows the formation of an image representative of the sole weld. The trend removal process leads to the creation of two level classes in the image. This is shown by the grey level histogram of the points between the ends of the plateau for each image column (see figure 3). Identifying the threshold can then automatically be done by searching a local minimum which separates the two classes A and B so as to keep only the weld points in the image. These points have a grey level which is greater than the threshold. Fig 3: Image thresholding by a histogram analysis according to the area approach principle (results shown are obtained from the image enhanced by a trend removal process). Results from the final detection are shown in figure 3. The white points characterize the weld points. Extracting the weld contour is a necessary step to finalize the segmentation method. In this way the B-spline curves are an interesting tool. They moreover have remarkable deformation properties. It can be noticed that these curves have often been used in segmentation techniques based on active contours . The problem now is to validate the whole method on radioscopic images. For this purpose, we shall see that adapting the "edge and area" combined approach is necessary to take into account the noise present in the acquisition system. We previously showed that molten zone limits on a simulated image were defined by the ends of a null gradient plateau. Processing the radioscopic image implies taking into account the grey level fluctuations induced by the noise present in the acquisition system. Considering one homogeneous area of the image, where the penetrated thickness is the same for each pixel in the zone, it is shown that the distribution of noisy grey levels follows a normal distribution. The circular geometry of the component implies that the penetrated thickness varies according to axis x (it decreases), but it is constant according to axis z. Thus each column displays its own normal distribution of levels as the penetrated thickness is different for each column. In general, the noise characterized by the standard deviation, s , is more important when the penetrated thickness is small, and the mean value, m, of grey levels in the studied zone is greater (the signal-to-noise ratio is in this case greater). Each column will thus be characterized by its own minimal gradient. As we use a statistical description of the noise identified by a Gaussian curve, it was decided to set a likelihood limit to define a homogeneous gradient zone. It is considered that an image column is homogeneous (in gradient) if 68% of the points in the column have a gradient lower than a given reference gradient. It is assumed that 68% of the studied zone gradients are located in an interval mg±3sg. The reference gradient, called rg, is set at an initial value 1, considering that a null gradient value cannot be representative of the noise. For a given column, the percentage of points whose gradient is lower than 1 is searched. If the percentage is greater than 68%, the column is then characterized by a rg equal to 1. Otherwise, rg is incremented by 1 unit, until the condition is verified. To detect the molten zone limits, it is sufficient to search the ends of the plateau for each column. They are characterized by the first points of gradient lower than the reference gradient of the column. Detection results are shown in figure 4a. As was the case with the simulated image, two characteristic zones A and B are displayed. Zone A, representative of the weld molten zone, is kept after thresholding (figure 4b). For a position close to the outer radius of the component, it can be seen that zone A does not completly define the molten zone limits. This is due to the presence of a variable weld reinforcement located at the surface of the weld. This should be taken into account to finalize the determination of the weld contour. The active contour method leads to segment the initial image acquired at F i=0°. An extra constraint is applied to push the B-spline curve at the weld bead surface. This zone, characterized by sudden transitions of grey levels, is displayed by maximum gradient points. The so defined model is flexible enough for the active contour to follow all variations of the weld molten zone (figure 4c). The deformation properties of the active contour are then used  to ensure a fast dynamic follow up of the molten zone limits on the whole set of the 180 images representative of the weld. Radioscopic images are analysed to quantify the general shape of the weld bead. Different geometrical dimensions [1,3] are thus automatically calculated in the contour of the molten zone. They allow control when the weld is under-penetrated, when the weld is assymetrical, or else if there is a gap in relation to the joint plane of the two components fitting into each other. The penetration depth is the most significant parameter to check whether or not the weld correctly performs its assemby role. It is given by the dimension X + e, where X is calculated in relation to the interlocking dimension (reference of the component) and where e is a fabrication dimension (see figure 1). The weld is well-penetrated when the bottom of the bead is superior to the interlocking (X>0) in acceptable limits, and is under-penetrated in the opposite case (X £ 0). If the obtained penetrations, measured on the 180 radioscopic images, exceed the minimum or the maximum authorized tolerances, the component is immediatly rejected and the welding parameters are re-adjusted. In the present study, a segmentation method applied to radioscopic images of a circumferential weld bead was presented to automatically control the weld quality. The direct problem modelling allowed to foresee in the image the grey level variations obtained from a sound weld. An edge type approach based on searching for a null gradient plateau, according to each image column, was then defined. Two zones were displayed. The former represents the molten zone limits and the latter characterizes the presence by projection of molten zone in the image. To automatically separate the two zones, in order to keep only the weld contour, an area type approach was defined. The "edge and area" combined approach was validated using a reference radioscopic image. The grey level fluctuations, induced by the acquisition system 's noise, were integrated and quantified in terms of minimum gradients. The active contour method then led to segment the image, using a deformable model, identified by a cubic B-spline curve. The model deformation properties were then used to rapidly and automatically determine the weld contour in the following images. Results obtained showed the good repeatability that the method offers. The method thus lends itself well to automatic and rapid fabrication control. Our thanks go to the DFTN/SCAC/LCND of Valduc CEA for their contribution to this study, and especially Messrs Jean Voisin and Philippe Bugeon.